This week I have been finishing off some new products and with all that sewing comes the need (yes the NEED) to buy more fabric. I know I rave about her work all the time but the talented Lu Summers of Summersville fabric is an absolute delight to work with. 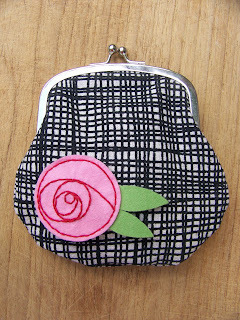 I have been finishing off some of these scrumptious clasp purses using her weave fabric yesterday to put in my shop today. Whilst looking around the web for new fabric I found lots more supplies that really inspire me to make more new items. I have been browsing Fabric Rehab for a while now but never bought anything so this was the month. I got some beautiful turquoise seed head print cotton and one of her bargain buy mini fabric bundles too. Only to go back on today and spot more new gorgeousness in the shape of this beauty called The big E bundle pink amber which is now on my shopping list. Another place I like to look for fabric is on etsy, its a great place to find textile print designers. Whilst searching I came across the shop of the amazingly talented Melissa Bombardiere. Her modern take on nature is really stunning, a simple but really eyecatching style. So I swiftly added her Mix pack of hand screen printed fabrics in red and pink to my favourites. Pink and red is possible my second favourite colour combo after pink and green. Better go and do some more sewing then to earn some money to buy all this lot, and also use up some of my ever growing fabric stash before it finally spill out from under the stairs.